2. Brush and coat the chicken fillets with the barbecue sauce. Leave to marinate a minimum of 10 minutes. 3. Heat an oven safe sauté pan and drizzle 1 tbsp. oil. Place the chicken into the hot an and sear the chicken fillets for 2-3 minutes on one side. Transfer the pan into the oven and cook for 15 minutes or until cooked through. 4. Meanwhile, prepare the dressing. In a large bowl, combine the oyster sauce, lime juice, sesame oil, rice vinegar, fish sauce, chilli flakes and siracha. Keep aside in the bowl until needed. 5. In a second bowl, add the chopped cucumber, bean sprout, spring onion, pea shots or cos lettuce and basil leaves. Keep aside until the chicken is cooked. 6. In the meantime, preheat a deep fat fryer or small saucepan of sunflower oil to 180˚C. carefully fry the wonton until crispy. Lift and drain on kitchen paper to remove excess humidity. 7. When the chicken is cooked through, remove from the oven. Place on a carving board and chop into pieces. 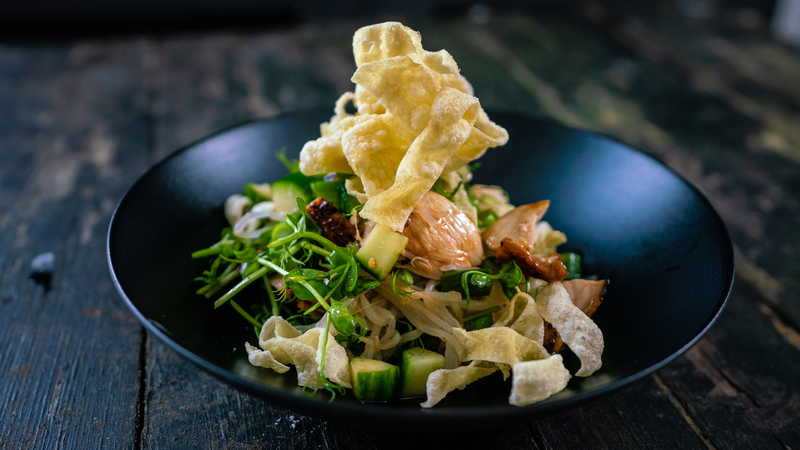 Add the cucumber salad and chicken to the dressing bowl and gently toss all the ingredient except the crispy wonton. 8. Serve the salad with the crispy wonton sprinkled over the top.